I had my SAN guy coming to me telling me that there was a problem with the network and that some troubleshooting was in order. He was getting replication errors from one SAN in our main site to the SAN at the remote site. I couldn't see any real evidence of a network problem, so I pushed it back on him. Well, it was a back and forth pushing of responsibility on this issue. Part of the problem was the terminology he used in describing what a "network" problem was. He used terms like 'routing problem' in trying to describe to me what his issue was. 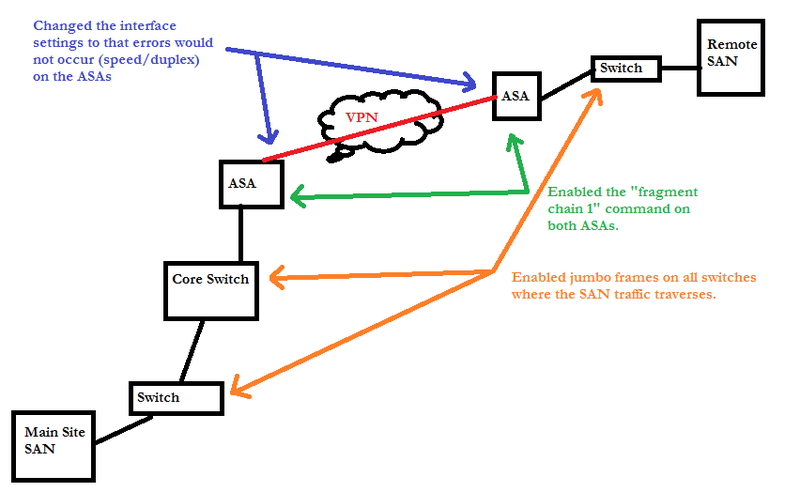 A simple ping proved to me there was no routing issue and that his SAN should be able to get to the remote SAN, especially since I could put my laptop on his SAN VLAN range and ping the remote SAN. No routing problem there. Either #2 or #3 resolved this issue and SAN to SAN replication is working now without issue. Very interesting problem and we now have resolution to it.